Ask any younger person, as I do with my residents each week, whether they read the newspaper or watch the nightly news and no hands will go up. This isn’t necessarily a bad thing, though it is different than how previous generations acquired news and interacted with media. You must pay attention to the trends in media consumption amongst this group, as they are your patients and/or parents of your future patients. Over two thirds of Millennials report that they are exposed to diverse views in their social media feeds. With content-based marketing and sponsored news articles, the news is no longer a destination for younger people but something that gets interwoven, mixed and mingled into their screen time and social networks. The goal for any smart marketer, including orthodontists who wish to build their practices through effective media platforms, is to find a way to be relevant inside the content and media channels consuming the attention of this generation. If you follow the on-line media platforms that you’re able to see for my bricks and mortar orthodontic and pediatric dental practices, you’ve seen a shift in content marketing away from treatment-specific topics towards more psychological benefits like self-confidence and even dietary advice and recipe suggestions for those considering orthodontic treatment. We’re meeting the consumer on their level and interacting with them just like the smartest news channels, as an intermingled component to their daily media consumption, not as a destination for heavy research on choosing an orthodontist. That conversation takes place behind lead generation advertisements and happens in a vacuum through email and direct mail. If topics like this pique your interest, I encourage you to investigate our resources in Advanced Marketing and Marketing for the Orthodontic Practice. In the meantime, sit down with your marketing coordinator and set a plan for the next quarter to score the relevancy of your marketing message in each of the most-popular media channels for your ideal prospect. With 1 being poor and 10 being exceptional, how would you rate the performance (return on investment) and relevancy of your message in each media? Anything less than an 8 needs to have attention placed on it during the upcoming quarter with results measured each month so that you can test, tweak and revise the message until you rate each media channel an 8 or higher. 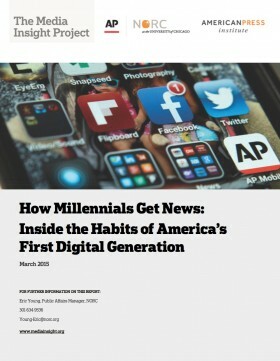 Click here to download the report (PDF) by the The American Press Institute.